EVERYONE loves this afghan. This is one of my favorite patterns for a baby blanket and a great, easy, and beautiful project. Baby’s ABC’s Afghan by Caron Design Team works up quickly and is a sophisticated gift for a new baby or for soon-to-be parents. This very cute blanket is very easy to make and very elegant and well worth the effort. You can always add a cute boarder to make the edges more interesting. I’ve made this pattern many times. Here is a better version of the chart. For more help watch the videos below. 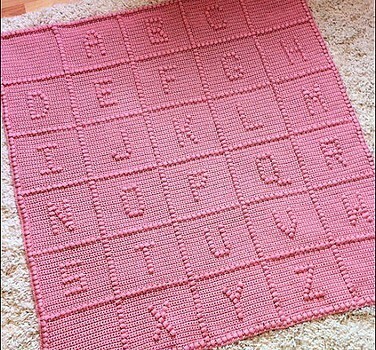 How to read the graph and tips on crocheting the Baby’s ABC’s Afghan pattern. Making the Baby’s ABC’s Afghan using multiple colors and explaining where to change colors. Thanks to Caron Design Team for this article inspiration and featured image. @[524984856:2048:Lisa Maloney], isn’t this cute?! Oh, this is so clever, and those popcorn stitches are easy to make! I really like this one. The hearts make it more fun! I love your colors too! Thank you! 🙂 I love that the pattern is so versatile. I’ve made several of these, and I’ve used different graphs and borders. You’re Welcome, Wasn’t sure if you seen this one. I have been wanting to make this afghan for yrs.